My husband and I were visiting family in Florida when the realization hit. I had to go to India. We had spoken about our desire to travel before, and although I hadn't visited anywhere outside North America,we tabled the journey due to debt and a desire to start a family. How very responsible of us. The world would be there. We should save. Get out of debt. Be grownups. Flash forward a few months. I can't be certain if it was the trip to Disney; seeing swarms of families while our family remained just one possibility in a hazy future that resisted all planning. Perhaps it was simply a moment of clarity...all I knew was that we has to go. T.J. agreed and soon the pieces to our journey fell into place. My company supports travel. T.J. was able to request additional time from work. Our short term loan for the bulk of the expenses got approved with ease. We found a great travel company that focused on younger travelers. This was happening. Why India? It was the most foreign place I could imagine that was relatively safe to travel to. It looked hard. Something about the images and the food felt stripped down yet so flavorful. I needed to be shook up. I wanted the challenge. Something just told me to "Jump". What a better way to learn about travel then to dive in head first into a third world country? Most folks seemed both impressed and nervous for us to go. "Are you sure you want to go to India?" "Are you dying your hair?" "Bring toilet paper and lots of hand sanitizer"
I'd like to say that I never panicked. That I never second guessed our choice. That fate propelled us forward with blinding optimism. But that's false. I did panic. I second guessed this trip from the moment we landed in Delhi and understood to our cores what third world really meant. It went from colorful NatGeo photos to real life real quick. I will never forget the acrid smell in the air walking off the plane in New Delhi at midnight on Sunday. We'd been traveling 24 hours and our senses were immediately heightened by the sheer shock. Had there been a fire in the airport? Was all of India burning? What was going on? Instinct made me immediately grasp T.J's hand for a reassuring squeeze and then immediately retract after remembering that men and women should not show affection in public. It took hours to talk myself out of bed the first morning. The sky was colored with a yellow haze and I still wasn't convinced we hadn't landed in a war zone. Why had we come here? Why couldn't we just have decided to go to Europe like every other good american? 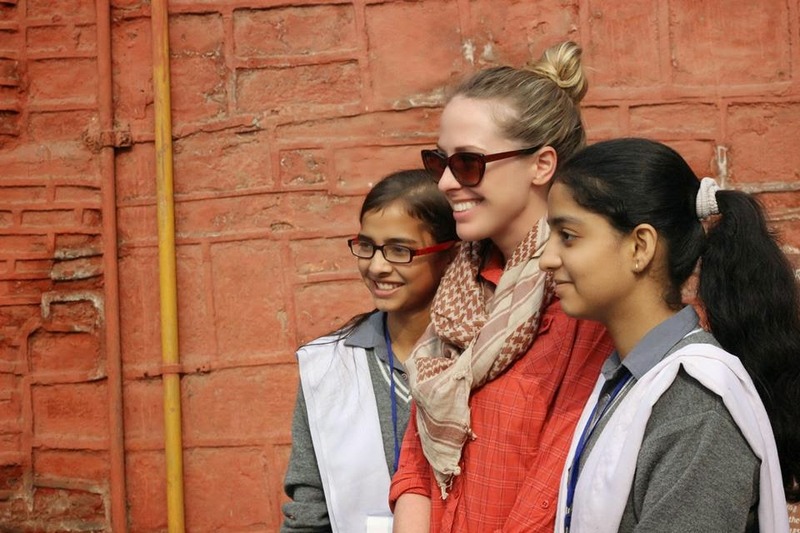 The first day in India was about relearning how to function day to day. We were stared at everywhere we went, sometimes politely, sometimes not. People snapped photos- we were a novelty. A joke? It was both flattering and uncomfortable but there was nothing we could do. Everything we knew- all the day to day rules were out the window. Make sure to check the bottle water caps. Only eat and shake hands with your right hand. Don't look beggars in the eye. No affection in public. Someone shaking their head no means agreement. Don't eat fresh veggies. Wash everything with bottled water. Hand Sanitizer is your best friend. Don't forget your deet spray, anti-malarias and money belt. Crossing the street was stressful. Driving was stressful. Ordering lunch was stressful. Question everything. India felt chaotic and unsafe. And then, we steadied ourselves. The first sigh of relief came from a dress shop owner in Canaught Place. I'd stopped in looking for a more traditional tunic. My husband noticed that there was a book on Nichiren Buddhism by the counter. We were quickly engaged in discussion with this amazing soul who practiced the same form of chanting I did. And the world got smaller and India felt warm and before I knew it, I was hugging a stranger turned friend in a country that doesn't encourage affection. 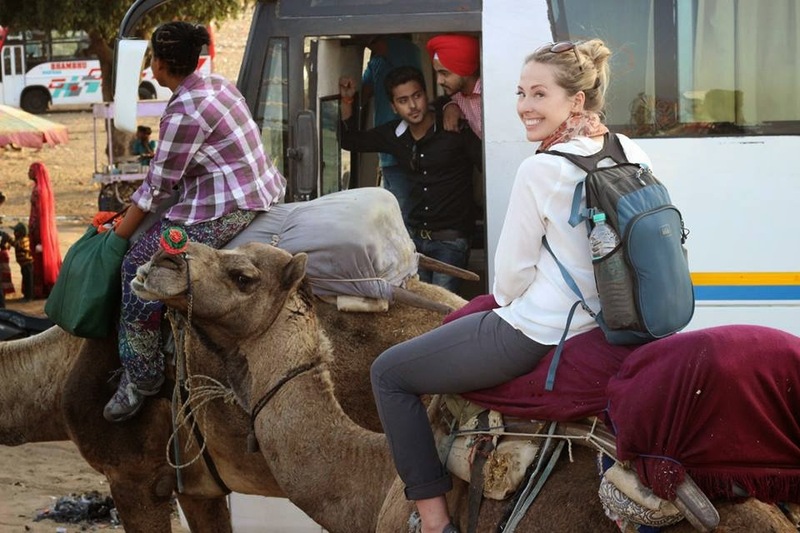 On our third day, we met with our group for the first time and traveled from New Delhi to Pushkar, a holy town a few hours away by train. The town was filled with travelers, both local and foreign and much of the town was closed off from vehicles. The air was clear and the sounds of distant chanting filtered through with the breeze. T.J. & I along with a few others opted for a sunset camel ride through the country side as a treat. Initially, my American fear took over as my "vehicle" stood up. There was no harness keeping me safe, no seat belt on these beautiful animals. "What if I fall? There goes the rest of my adventure." "Oh no, what are the hospitals like here?" "How far IS the nearest hospital?" "They would never allow this in the States"
The setting of the sun against green fields of farm and mustard flowers distracted me just long enough to take my breath away. The woman using a hand plow in an orange sari looked like a painting. I locked eyes with the gypsy children who had ran to the road to get a peek at the foreigners. What were they thinking looking at us looking at them? Then there was the sunset again. Oh the sunset. And then, I quieted and the internal chanting that had been calming me since sitting in the seat at LAX took over. Instead of fighting against or trying to put this new world into the context of my own, I opened my soul to the fear of the unknown and trusted that we were headed down the right path and that although we didn't know WHY we needed to come here, that the beauty would lie in just letting go. My fear of falling evaporated and in its place, a swelling sense of freedom. Where would this journey take us next? The next post will be on how opening night of a Bollywood film changed my views on Indian Culture. Stay tuned.